from all stakeholders in a project. Maintenance preparation during the early phases of plant and facility projects. MasterConcept is more than a leading engineering and design solution. With Ides solution for information sharing between stakeholders in plant and facility projects, you ensure standardization, data quality and traceability. And not least, maximum efficiency during commissioning and handover. 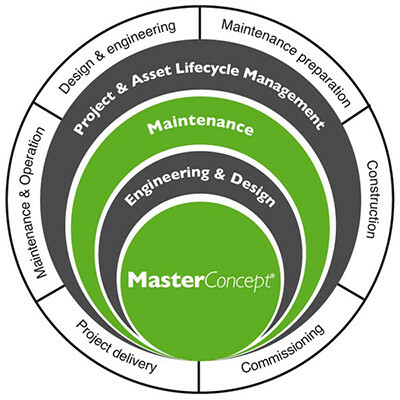 MasterConcept also creates conditions allow you to include the maintenance aspect of assets in the project’s early phases. This results in more efficient projects, lower costs and maximum utilization of plants and facilities. In more than 20 years, we have delivered solutions for engineering and design, document management and project collaboration. This experience and our development in close relation to our customers is the reason MasterConcept today is a leading solution on the market.